Due to its location on the South East coast of the island, Larnaca weather is very hot throughout the summer months but enjoys the nice breeze generated by the sea. Being on the coast, the weather in Larnaca is not as hot as some of the towns inland but it still experiences average temperatures of up to 33°C through the summer months. If you are visiting Cyprus during the summer months, the first thing you will notice when you land at Larnaca airport and the aircraft doors open, is the intense heat of the weather. As you can imagine, these temperatures can become a little uncomfortable, especially during the peak times of the day when the sun is at its hottest. It is advisable to ensure you have adequate sun protection applied if you intend staying out in the sun during these times. Spring is a very pleasant time to visit Larnaca as the daily temperatures are between 23-30°C. This provide the ideal climate to enjoy long walks along the sea front or relaxing by the pool. 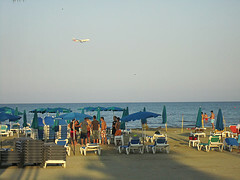 Summer in Larnaca normally begins in June, although the warm weather does start much early. July and August are generally the hottest months in Larnaca, as this is the height of summer. Larnaca is one of the tourist resorts in Cyprus, visitors can enjoy long hot days as they soak up the sun on the beach. Throughout the Winter months, the weather in Larnaca does drop and is a little colder throughout the day. However, the yearly climate in Cyprus is generally quite mild and the Winter months normally drop to temperatures of between 15-18°C. The coldest months of the year in Cyprus are January and February. Night time temperatures in Larnaca throughout Winter can drop to as low as 7°C and it is recommended that you pack a jacket or cardigan if you plan visiting Larnaca throughout these winter months. As a country, Cyprus enjoys a warm mild climate throughout the year with very hot summers. If you intend visiting Larnaca, we hope that this quick guide on Larnaca weather will help plan your trip.